Here are a few resources you may find useful, if you have updates, suggestions, or comments, please post 'em in the forums! Here are some other places to go if you want to buy or build a TB303 clone. ML-303 a German project, sadly discontinued as of 2004. An inspiration! Acidlab Bassline another German project. Not a 'true clone' but similar sound. Concussor from Analogue Solutions, in the UK. Now available! A 'true clone' with 'DevilFish' mods, but without sequencer. 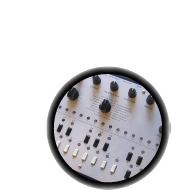 TB3031 from Oakley Sound, the successor to the TB3030, a DIY rack-mount version. TM3030 from Oakely Sound, available 2/2007. Kit, MIDI controlled (no sequencer). Technology Transplant builds & sells TB303 keyboards, pots, etc. replacement parts. Where to get those strange components? We had a lot of luck going with these suppliers...each one may carry a few different parts, none carry all of them!